Microsoft Teams is the ultimate hub for teamwork and intelligent communications. Built on the strength and scale of Office 365 with over 120 million users, Microsoft Teams delivers chat-based collaboration, meetings, calling, and enterprise voice features. Why integrate with Microsoft Teams? Use Microsoft Graph to create a new virtual team when a new business issue arises, add the right people to the team, and configure the team with channels, tabs, and apps. If you want to get the new team together to discuss the business issue, add a new event to the team calendar. When the business issue is resolved and you no longer need the team, use the Microsoft Teams API to archive or delete the team. If you know the maximum duration of the team when you create it, set an Office 365 group expiration policy for the team that automatically removes the team according to the policy. Use application permissions to work with teams, channels, and tabs without human intervention. Create a new channel when your customer files an order. Automatically create teams for classes at the beginning of the school year, and archive them at the end. Let customers to create new teams and channels. Install your Teams app in the new teams. Pin your app to a tab in the new channel. Send messages to the channel linking back to your website. Microsoft Graph makes it easy to create large numbers of teams and populate them with users and channels, by automate creating and managing teams, channels, tabs, and apps. 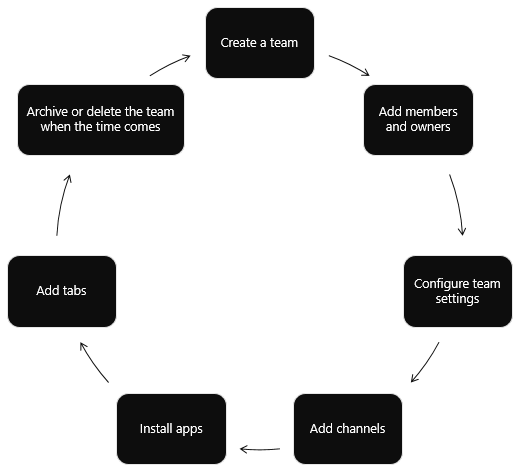 Microsoft Graph also lets you find and archive the teams you are no longer using. This is the same API that the Microsoft Teams Admin Center and Teams PowerShell commandlets are built on. List the teams in your tenant, and install apps to them. Create tabs in channels to give users easy access to apps. Microsoft Teams apps give work groups a new tool to make collaboration a more productive and compelling experience. These apps let work group users share assets, interact through chat, and schedule events on the team calendar. These apps can also automate creating teams, channels, and conversations, enhancing the value of Microsoft Teams. You can create web sites, services, and native platform applications that run outside the Microsoft Teams user experience, and call the Teams API to automate Teams scenarios. These collaboration tools include Microsoft Graph-enabled tabs or bots running inside Microsoft Teams apps. You can also call Microsoft Graph outside of a Microsoft Teams app, such as from a website or a web service. If you've already enabled your website for Microsoft Graph, you can use that work for Microsoft Teams by using the Microsoft Teams developer platform to create a tab that uses the existing website code. Tabs Surface your content in Microsoft Teams. Bots Help users get tasks done in conversations. Connectors Post updates from external services to channels. Actionable messaging Add enhanced interaction to your connector cards. Messaging extensions Allow users to query and share information in conversations. Websites Surface enhanced content in your web pages. 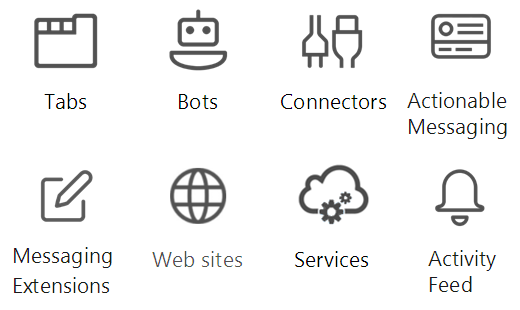 Services Enhance your client applications with Microsoft Graph data via your web service. Activity feed Engage users via feed notifications. Calling and online meetings (Preview) Create Microsoft Teams apps with bots that can initiate and participate in audio/video calls, route/transfer calls based on interactive voice response (IVR) flows, and participate in online meetings. See the Teams API in Microsoft Graph. Learn how to use the Microsoft Teams API. Drill down on the methods, properties, and relationships of the team, channel, and group resources. Try the API in the Graph Explorer. Read more about the Microsoft Teams programming model. Explore the calling and online meeting APIs.